I promised Treefox that I'd put up a step by step of my "Brothers" picture, so here goes! The timings are estimates, because I did this over a few days, working a few hours at a time. I usually start by gathering reference images of the characters I want to draw. 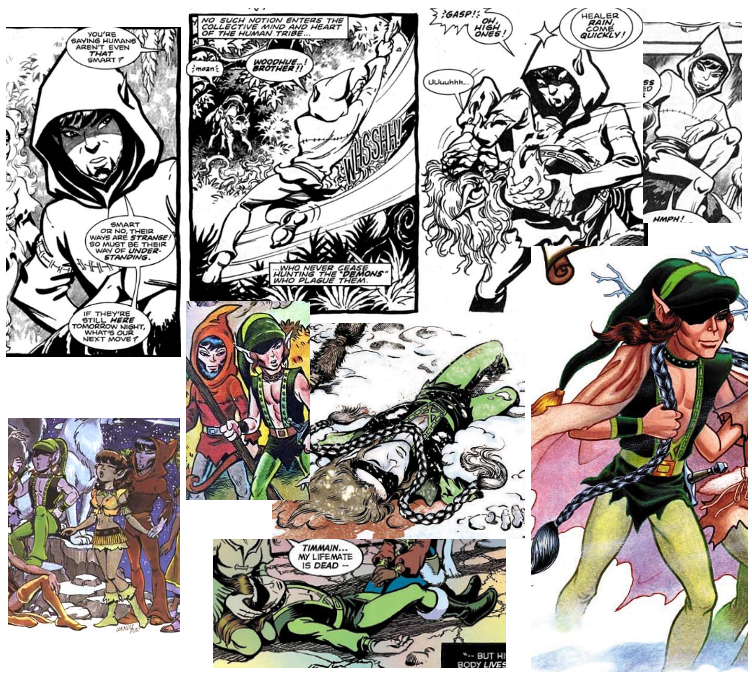 Since I don't own any copies of the comics, I have to use Google. I need to try and save some money for a Complete Quest edition! 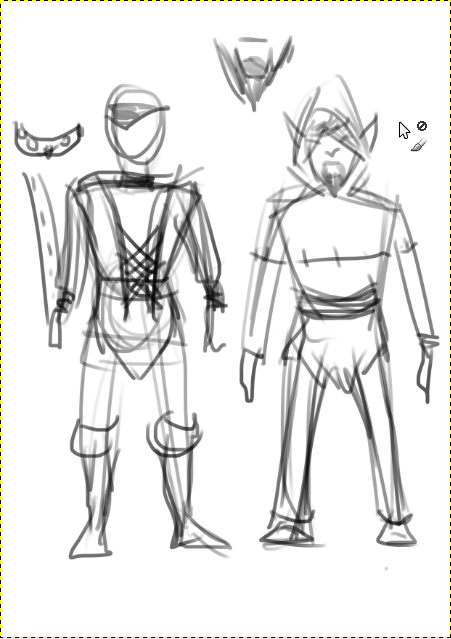 After I've got enough references, I draw a quick sketch of the characters and their gear (optional), more like a note than a correct portrayal of the characters. Sometimes I skip the sketch if there's a good enough reference screenshot. Then starts the actual drawing process in Gimp. I like to start with an A4 300dpi canvas with white background. I like to sketch very loosely, and plan the poses on the go. I use just a hard round basic brush, with pressure sensitivity on size. Oh right! I draw with a Wacom Intuos 4 graphics tablet. Rather than erasing something I don't like, I just make a new layer and continue sketching. That's why some of my layers are incomplete and show only a part of a character. During this phase, I use Gimp to cut, copy, stretch and scale parts of the sketch to get the proportions and placements how I want them. Unlike traditional drawing, it's easier to compose multiple variations of the scene this way. Sometimes the characters' poses change quite a bit while I'm sketching. I first sketched the brothers sitting leisurely, but it felt kinda boring, so I decided to make them laugh. I imagined I'd draw One-Eye leaning forward in a fit of laughter, but since the pose was too parallel to Longbranch's, I decided to make One-Eye lean back instead. This way the scene became more open. It might take around ten layers worth of versions before I settle on a composition I like. 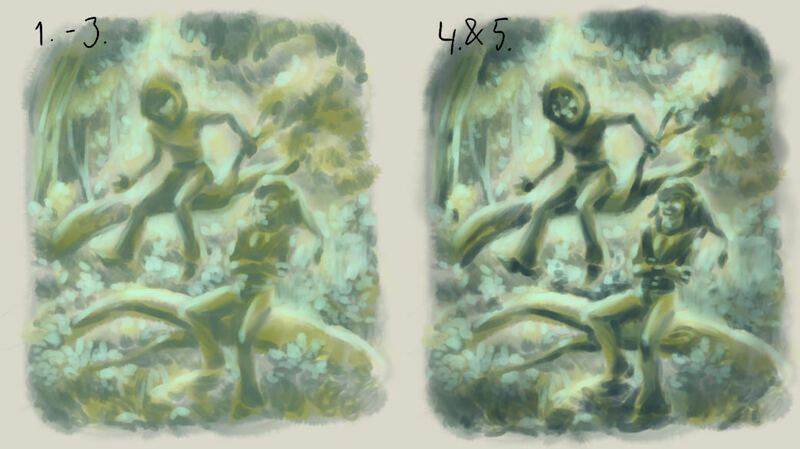 I'm not too concerned when it comes to sketching a forest background. I usually leave it to the line art phase, so it really doesn't have a proper sketch. Drawing shrubbery and trees are easy when drawing background, because they forgive so much in perspective compared to buildings that cannot have irregular shapes. For now, gestures of the trees that the characters touch are enough. After sketching comes the line art phase. For this, I give the image an outline (if necessary), and save it as a transparent .png. Then I open it in MyPaint. You could just finish the image in Gimp, but I like the brushes and drawing environment in MyPaint, so I like to do the line-art and coloring process there. Besides, it's completely free! Since MyPaint has an infinite canvas, you can't tell where the original image borders are. That's where the previously made outline comes in handy, especially if making something for the calendar. But since this doesn't have any strict measures, it doesn't matter. I pick a brush that's to my liking (I think this time it was a "deevad/2B pencil", which has a very pencil-like look), adjust the line and start drawing with the characters. Most of the time I start drawing the characters from their head, but sometimes I might start from their torso, too. 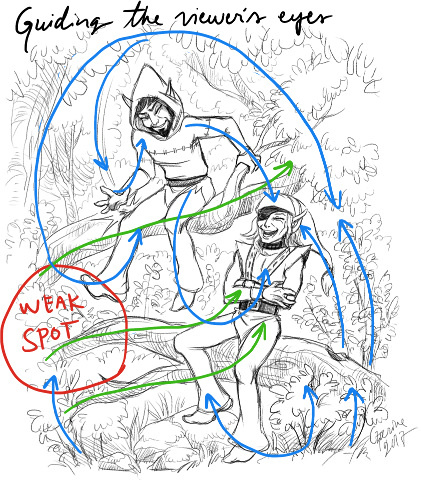 It really depends on which part of the character seems to be "central" to their positioning in the image as a whole. The same goes with faces, so I often start drawing the facial features from the character's nose. It makes grasping the proportions of the character and the scene easier, because the rest of the character kind of "extends" or "fans out" of that spot. With traditional art it also helps preventing the character's head or feet getting cut off the paper during sketching! Sometimes, if the image has a lot of overlapping characters or objects that have details, I draw their line arts on separate layers. That way I don't need to worry about erasing some lines off a character I've already finished outlining. In this case, the characters weren't overlapping, and the image itself was quite simple, so I drew everything on one layer. After I've drawn the characters, I draw the background. This is often a very relaxed part of the process, since I can draw details on the go and without much precision. The only thing I try to focus on is how the lines in the image guide the viewers eyes. In this case, the trees and bushes try to guide the viewer's eyes back to the characters. The weakest spot is on the lower left side of the picture, because there's nothing to bounce the focus back to the center, but the multiple parallel lines formed by the horizontal trees should balance it out. Then it's time for my (in)famous sloppy coloringTM! MyPaint has a nice, light brown (or warm grey?) background to start with, so I kept it. I wanted to give this image a dreamy feeling, so I didn't put any flat colors in. Instead, I picked a "deevad/watercolor glazing" brush, and loosely applied a layer of low-saturation green to form shadows and a yellowish green for midtones. 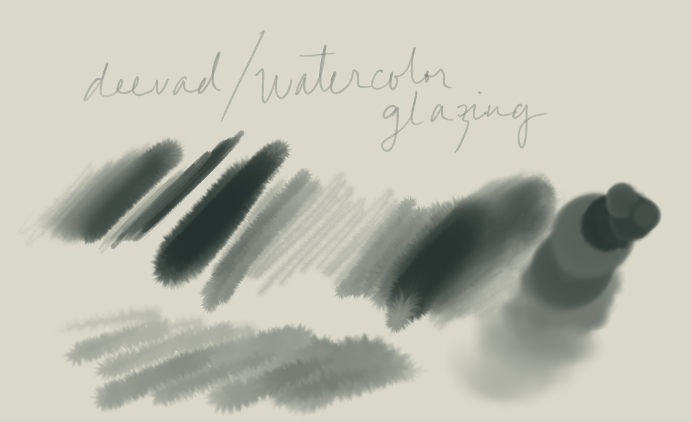 The watercolor glazing brush is great for this, because its pressure sensitivity affects the size and lightness of the brush, meaning that you can go over darker areas with a lighter pressure to blend the light and dark color together, sometimes even adding lighter color over a darker one. I like this brush, because it mimics watercolors but gives you better control over the outcome. Usually I color everything in grayscale before adding colors (hues) on an overlay layer, but since this was going to be almost monochromatic, I skipped that. I used the watercolor brush to get variation to the color values. 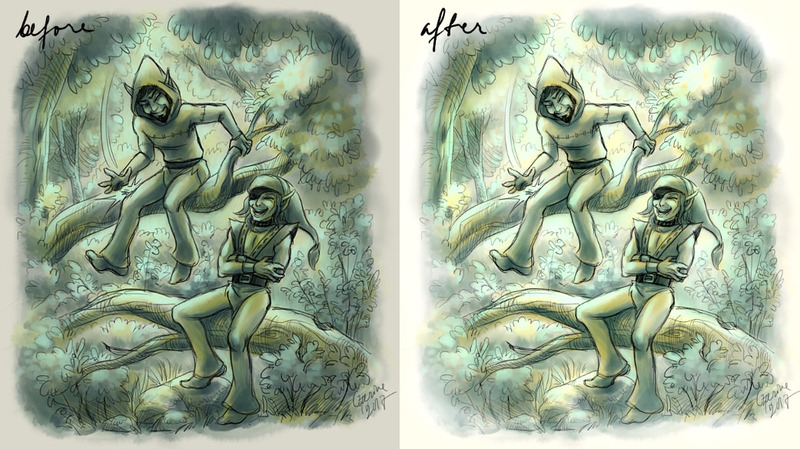 When coloring, I don't use many layers, unless I'm uncertain if a color will work well on the image. I'm not very good at picking colors. I often end up with over saturated rainbow-puke drawings, so working with monochrome is easier for me. I decided to stick with greens, yellows and blues, because they all can be mixed with each other pretty much in any way without looking bad. I made the darkest greens and yellows quite warm, but added highlights in a cold, blueish hue to give the image an eerie feel. To enhance that, I blended the edges of the image to fade to the canvas color. The watercolor glazing brush can do wonders with just one color and some changes in the brush size. After this, I saved the image as .png and moved back to Gimp. There I adjusted the levels, contrast and saturation to my liking. This time I lightened the image quite a bit, and added lighter color to the edges to give a kind of vignette to the image. Lastly, I cropped the image a bit. That's it! I hope I didn't forget anything. So much fun to see your process. Thanks for posting this. Hum, the images don't render completely here, but I can get that sorted out on my box. I especially like the use of libre software, here. In my case every step takes longer. Even looking for references, or creating references. Oh my! Thank you! This is done so nicely and with so much detail! Love to see this process. Man, I absolutely adore the way you draw and color. I am happy to see that your original sketches are also rather wild and intuitive. Darn it, I should've squeezed the images a bit smaller! Now it creates a horizontal scrollbar at the bottom. Oh well! Ah, now that you mention it... yeah, a scrollbar. How convenient. Thanks for the heads-up. Now I can see them completely.